Raindance Select overhead or hand showers have a Select button, which you can gently press to select different jet types. 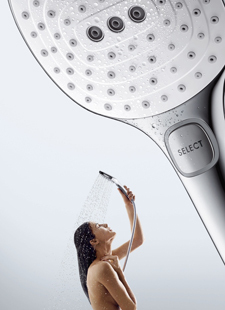 You can also control your shower heads using the Select button on thermostats such as the ShowerSelect or ShowerTablet. Laborious rotating and setting of showering modes are now a thing of the past – particularly useful when you have soapy hands. Aside from the fact that it works great, is a real eye-catcher and fun for everyone, the Select button also symbolises the following hansgrohe operating philosophy: good bathroom design needs to be intuitive and convenient. For everyone. Perfect for cross-generation bathrooms: Select makes showering easy for people of all sizes/ages.